We often read the Petersburg siege demonstrated the emergence of “modern war” in some fashion. The “coffee table book” history draws the the comparison between Virginia trenches of 1864-5 to French trenches of 1915-8. There is some resemblance, but no more than any functional nature would derive. Men can only dig a hole in the ground for protection in a finite number of combinations. Nice surface comparison, but for the most part the trenches are not exactly a mountain of evidence for the “modern war” argument. Four 10-inch mortars with a proper supply of ammunition are wanted in the battery near the Taylor house to control a battery of 32-pounder rifles just beyond the crest, distance from 1,200 to 1,500 yards. It would be well to get them out to-day ready to move; they may be ordered into battery to-night. I will inform you then whether to send them. Please answer. If the 10-inch mortars are ordered forward, I would earnestly request that they be put in the fourteen-gun battery where Pratt’s 4½-inch guns were. The range is essentially the same. The approach to this battery is very good, and to the old battery very bad, a matter of great importance in supplying 10-inch ammunition on account of its great weight; and, moreover, this battery is well made and the old battery very ill constructed, constantly caving under mortar fire. The correspondence does not specify which Confederate battery was the target. 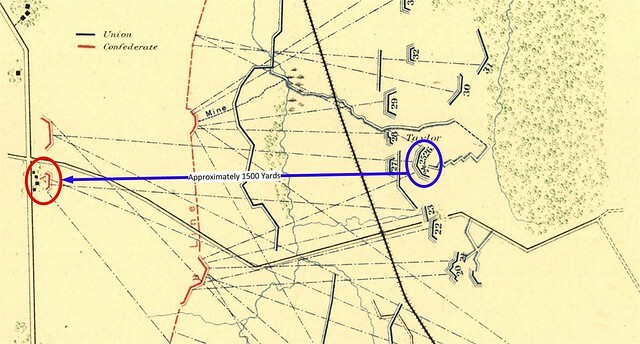 For the map above, I’ve highlighted one such battery, which would be “beyond the crest” and approximately 1,500 yards distant. Notice the close proximity to the mine crater. The range cited was well within the capabilities of field pieces. The Confederate guns mentioned were indeed large caliber weapons. But the Federals might have concentrated the fires of several batteries to damage the battery. However, having read about the thousands of shells dumped on Fort Sumter, we must ask how long and at what cost would that be completed? There is no mention if Hunt required the use of 10-inch case shot from the mortars, as used during the Battle of the Crater. 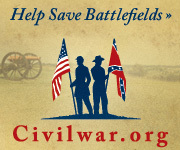 That particular projectile, of experimental nature, would have done well to silence the Confederate battery while field pieces demolished the earthworks protecting the guns with direct fire. I am out of my supply of Coehorn mortar shells and the rebels are taking advantage of it. Please send me any shells and wooden plugs which you can possibly procure, on the mail boat, telegraphing me when they start. I don’t care for prepared ammunition. Time is very important. I have sixteen Coehorn mortars in position and not a shell in depot for them. The rebels keep up a constant mortar fire on us. I don’t care for prepared ammunition; all I want are shells, fuse-plugs, and paper fuses. These must be received very shortly or the army will suffer. I wrote on 15th ultimo, and telegraphed on 19th ultimo and 11th instant for a large supply. Please inform me at once whether I am to be supplied. Please also send 2,000 Parrott time-fuse plugs for siege guns. The Confederates had also learned the value of vertical fire, and were now in position to employ some of the heavy mortars from Richmond along with some expedient weapons. And at the same time, the Confederates were commencing production of their own Coehorn mortars. Fast forward to 1917. When preparing the American Expeditionary Force for combat in France, American officers found themselves short of artillery in general. But most acutely they called for howitzers and mortars capable of high angle fires. Henry Abbot would have given them an “I told you!” look. Vertical fires would become the dominant form of artillery support on the battlefield.